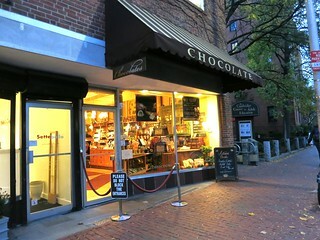 Even though I'm not sure who decides on these national food holidays, since it's National Hot Chocolate Day, I thought I'd write about Boston's most popular hot chocolate spot, LA Burdick near Harvard Square in Cambridge. Other than their house signature hot dark chocolate, I also like LA Burdick because they serve single source/ single origin hot chocolates! When I went they had two different ones from Grenada and Ecuador. I tried the Ecuador one, described to have "notes of black tea, cinnamon and earthy flavors ... robust ... with a very long finish". It was quite intense but I loved it, although I still had a hard time deciding if I liked the signature one better. 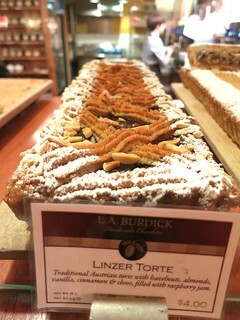 LA Burdick also serves both Austrian tortes and other cakes. 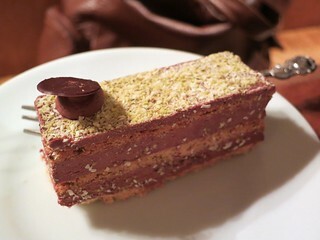 The torte was on the dry side, in my opinion. 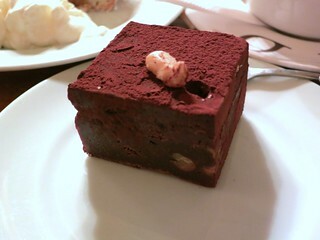 You're better off with the cakes. 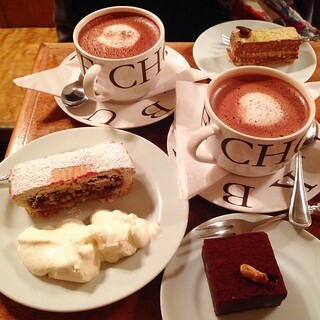 Honestly, a cup of the hot chocolate is rich, intense, and sweet enough that you don't really need cakes, but hey, indulge if you wish to!